Not very far from Calgary, a city of over 1 million, is the quiet town of Crossfield. Crossfield has a population of 2861 according to their official website. Two weeks ago the population jumped by 3 as my wife and I plus one of my photo buddies Mark Bingham ventured out to enjoy this sleepy little town. 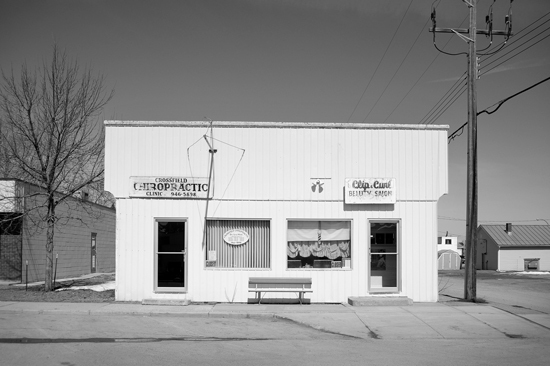 One of the things that strikes me about these small prairie towns is the quality of light. For some reason it seems brighter and clearer than in Calgary. This is probably true since they don’t have the pollution we suffer on a daily basis in Calgary. I think I read somewhere Calgary is the asthma capital of North America. Part of this clarity renders white buildings, very white and very bright. This combined with a deep dark blue sky offers the photographer some wonderful contrasts to play with. A person might be tempted to add a polarizer to enhance this even further. This would be a mistake in my opinion, at least for the subject pictured above. It’s hard to find a building in one of these towns without a half ton truck parked out front. Since these rural residents enjoy their open spaces and it seems they don’t like to park next to each other as well. Hence the vehicles are very well spaced down the street. You can’t be in a rush either. Chances are a car or truck will pull up right in front of you blocking what you are trying to photograph. The curious passengers will either just look at you in amazement trying to figure out what you find so interesting or will actually ask you. What a refreshing change from the city where I have had things thrown at me while photographing along busy streets. One more thing I enjoy about these small towns are the young bucks cruising up and down the main drag, in first gear, punched out mufflers announcing their impending entrance to every young gal in town. Reminds me of my youth in Calgary. We use to disconnect our mufflers, or for the better off buy Thrush Mufflers, and cruise the “circuit” downtown. Pink slip racing was the order of the day. If you pulled up beside a Hemi Barracuda or Duster 6 Pack you knew you would be eating dust. I use to have a 1967 Belair station wagon. Real chick magnet! Not. Until I lit up the backend and took out one of those Mopar muscle cars. Yup my wagon was a sleeper. The 327 was totally blueprinted, all kinds of extra goodies added to the motor and cranked out over 430 hp. I would go through two automatic transmissions a year. It just tore them apart. Back in those days we didn’t worry about gas mileage. I suspect this baby got in the single digits. Those were the days. Road Runners, Chargers, Barracudas, GTO’s, Da Judge, Firebirds and the Camero. Corvettes were for sissies or old guys with bad hair pieces and heavy jewelery. I took my Linhof Technica IV out to Crossfield in addition to my Nikon D700. Had a lot of fun setting up my shots with the Tekinator. Metering, adjusting swings and rise all those activities that allow you to drop into the “Zone”. Apologies to Ansel for using his great system as a pun. I made two film images that day. Both ruined by a bad film holder. The image above was shot as a backup with my D700. Lucky I did. Will this discourage me from using my LF gear in the future. Not in your life. It’s only a little bit about creating images and a lot about soothing my soul. I find film photography to be very relaxing. I love the pace, the contemplation, the excitement over getting it all right. I still get excited about seeing my negatives for the first time after a bath in the fixer. Watching the image emerge in the developer when printing brings me right back to working along side my dad in the darkroom. It also reminds me of my newspaper days, teaching darkroom technique to people who themselves are seeing their images come up for the first time. All this is missing from the run and gun digital photography most people practice. I will be increasing the population of Crossfield by one once again in the near future. I still want those images on film. Digital is nice but for me at least it has no soul. Nice reading. Lunch hour buzz. Glad you liked it Laurie-Lynn. if you had successfully used the magnachrom spreadsheet and if it was still available anywhere? I tooI love the convinience of digital but agree it can be souless which is why I continue to enjoy film and messing about in the darkroom!